Following a gluten free diet doesn’t mean you have to give up the starchy foods you love – bread, pasta, cakes, etc. 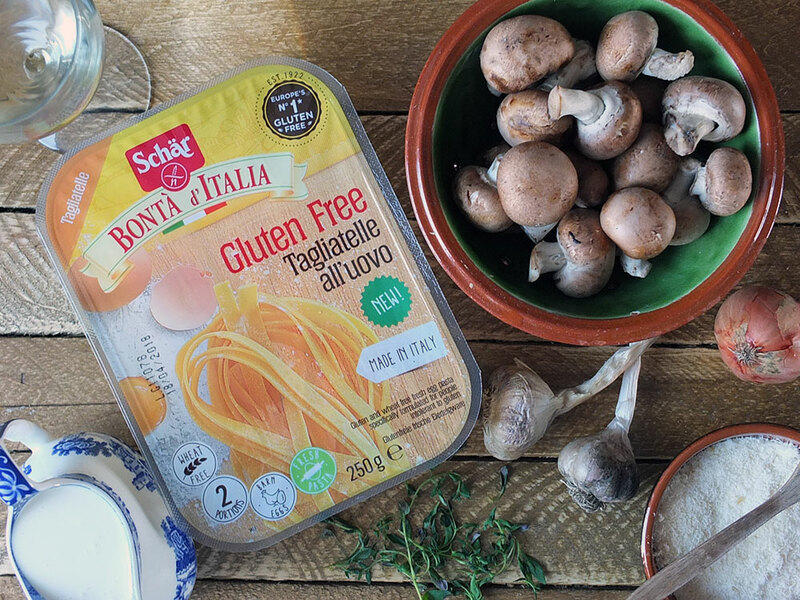 Here I present to you the new Bonta D’Italia fresh gluten free tagliatelle from Schär, Europe’s No.1 in gluten free. They’ve created three gluten and wheat free fresh egg pastas specifically formulated for people intolerant to gluten: gluten free tagliatelle egg pasta, gluten free ravioli with ricotta cheese and spinach and gluten free tortellini filled with prosciutto. 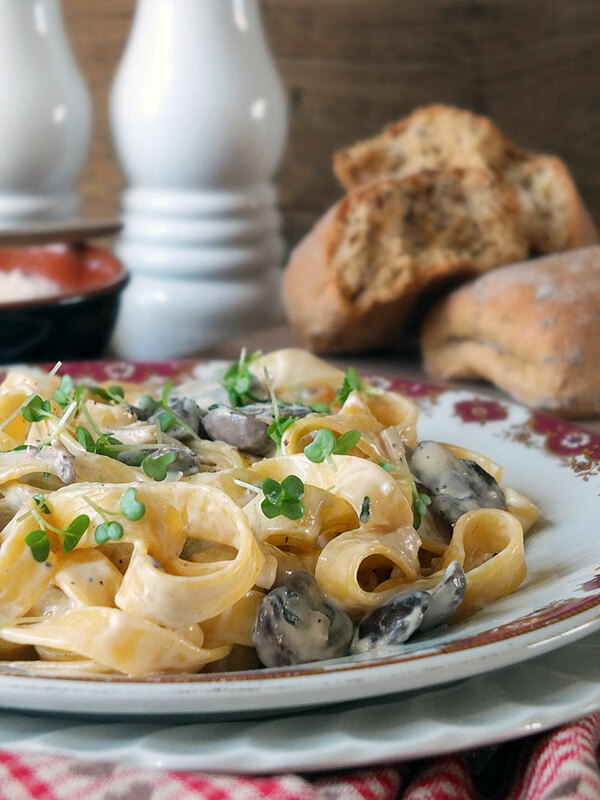 I’ve created a rather delicious creamy baby button mushroom, white wine and thyme sauce to serve with the gluten free tagliatelle. Step 3: deglaze the pan with a glass of dry white wine. Simmer to reduce. Step 4: add vegetable stock and heavy cream. Reduce heat and simmer until thickened. The resulting dish is incredibly rich, creamy and delicious: perfect for a quick mid-week dinner. Serve, as pictured, with some warmed Schär gluten free brown ciabatta rolls dipped in olive oil for an authentic Italian experience. A note on step 5, above – before you add the pasta, the sauce is still quite thin. When you drain the pasta (not thoroughly) a little bit of the ‘liquid gold’ cooking water remains. 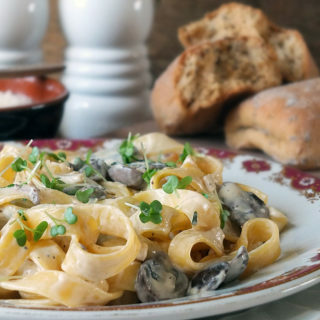 This starchy water acts as an emulsifier, meaning your creamy sauce will stick to your pasta just the way you want it and not pool in a puddle at the bottom of your plate. Alternatively, reserve a small ladleful of the cooking water and add it to the sauce at the end while it simmers, stirring until thickened. Schär Tagliatelle, 250g, £3.50 Ribbons of fresh egg pasta which make the perfect base for a flavoursome dish. 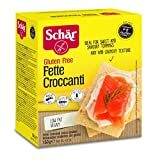 Schär Spinach and Ricotta Ravioli, 250g, £3.75 These delicious ravioli parcels are filled with spinach and ricotta. Ready in under 5 minutes this pasta makes for a delicious quick and easy mid-week meal. Schär Tortellini with Prosciutto, 250g, £3.75 Tasty tortellini filled with Italian ham, made lovingly in their kitchen so you can enjoy a wholesome pasta dish in yours. If you’re looking for sauce recipe to serve with your gluten free tagliatelle and my creamy mushroom, white wine and thyme sauce doesn’t quite fit the bill, you might like Kavey’s King Oyster Mushroom and Cream Pasta, Choclette’s Wild Garlic Pesto, Nanya’s Roasted Tomato Sauce, Heidi’s Italian Ragu Sauce or Camilla’s Chilli, Bacon & Chickpea sauce. Alternatively, you might like my Quick & Easy Chilli Sauce or my Roasted Cherry Tomato Sauce. I’ve also got a creamy sauce recipe with shredded courgettes in it and a hidden cauliflower cheese pasta sauce recipe you might like. 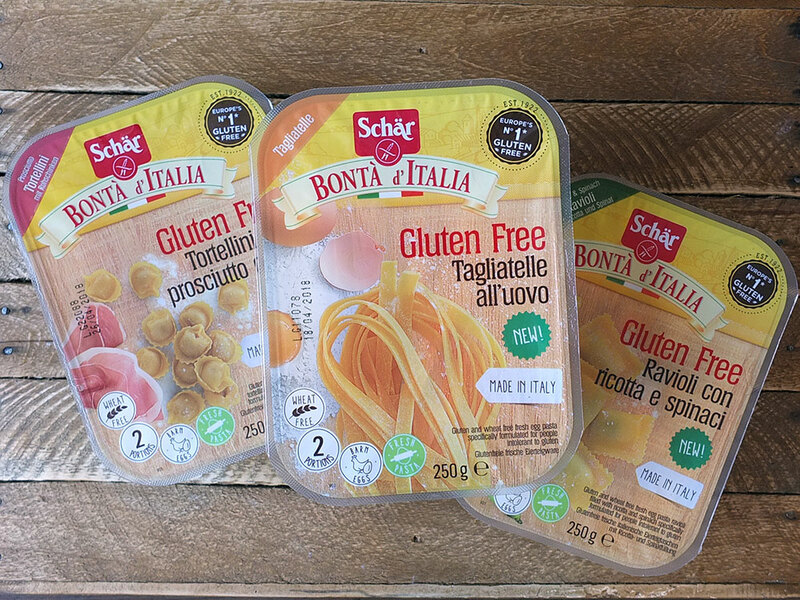 To find out more about the new Schär gluten free pasta range, and to find out what other delicious gluten free products they produce, visit the Schär website. You can also find them on Facebook, Twitter and Instagram. Here in Shetland, the Eid Community Co-operative on the west side stocks a wide range of Schär products. Baby button mushrooms, garlic, white wine, thyme and cream make for a simple but delicious pasta sauce. Perfect for a mid-week dinner! Heat butter in a saute pan over a medium-high heat. Saute the shallot and mushrooms together for a few minutes until they begin to brown. Add the garlic and thyme, and saute for another thirty seconds, until the garlic imparts its fragrance. Add the white wine to the pan and deglaze the pan, stirring up any bits that might be stuck to the bottom. Add the vegetable stock and simmer for another two minutes before adding to the cream. Turn the heat down and simmer until the sauce thickens. Meanwhile, bring two litres of salted water to the boil. 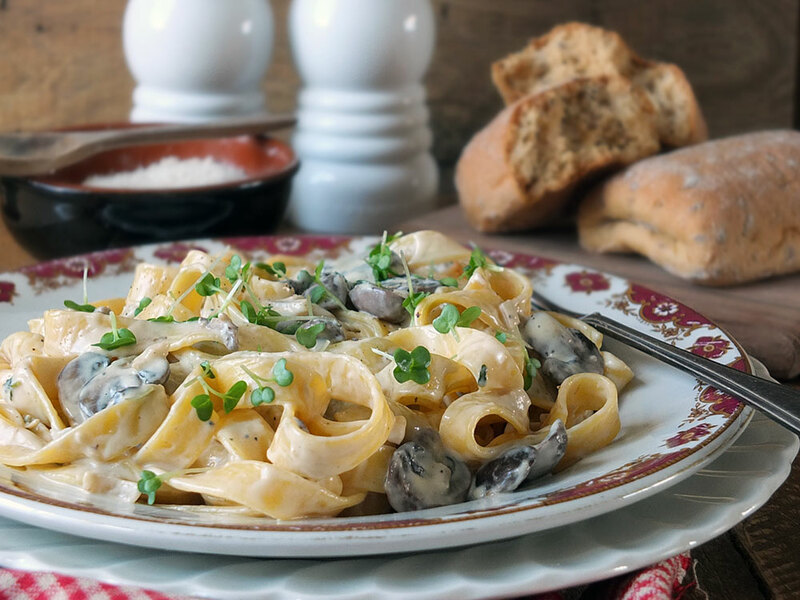 Cook the fresh Schar gluten-free tagliatelle for 3-4 minutes. Drain well. Add the drained pasta to the mushroom and white wine sauce and stir to coat. Turn off the heat, cover and leave for a few more minutes while you set the table (and call everyone to dinner!). Give the pasta and sauce another stir, by this time it will have thickened up nicely with the starch from the pasta. Serve with plenty of freshly ground black pepper, a sprinkling of sea salt and Parmesan cheese, to taste. Garnish with cress leaves. 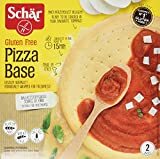 This is a sponsored recipe post in collaboration with Schär, Europe’s No.1 in gluten free. Thank you for supporting the brands who make it possible for me to do what I love: mess up my kitchen and share recipe stories. I would have to agree that this is perfect for a quick dinner. It is indeed delicious, creamy and rich.We just loved it. We enjoyed it with some garlic sticks. My family wants me to make this again this weekend. Wonderful recipe! It’s my kids favorite recipe. Thanks so much for sharing! 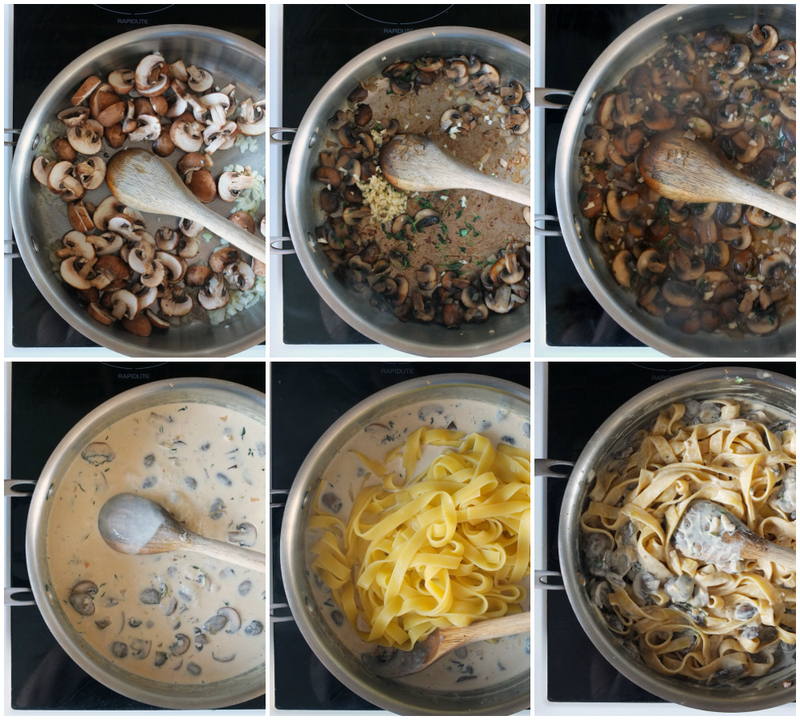 Oh my goodness this actually looks like a better version of my go to mushroom pasta recipe haha. I never think to put wine in sauces. Mainly because I just drink it instead! I’ll definitely be giving this a go though because I’ve found my version gets a bit cloggy if that makes sense? Like when you make a creamy sauce but it’s almost too creamy? This looks so good! 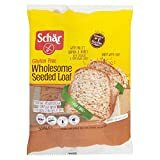 Not tried the new Schar stuff yet but keeping an eye out for it being on offer! Oh, my goodness!! This gluten-free tagliatelle looks really delicious. I will surely give this recipe a try. My hubby would love this so much. yum!!! 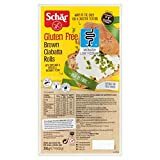 I actually love that more brands are introducing gluten free options, and its something that my friend as a coaliac definitely appreciates as well. I love how you have teamed it with that rich creamy sauce and it certainly has my mouth watering that is for sure! This recipe looks so delicious and great it is Gluten free! I must try it out as I do suffer with bloating so it may help! That looks really good, i’ve Got a couple of friends who are gluten intolerant so i’m always looking for tasty recipes to make for when they come to dinner. I would have mushrooms on or in everything given half the chance so this looks amazing! Ooh, this sounds heavenly. I am unable to resist creamy sauces. They go particularly well with tagliatelle for some reason. I haven’t tried this brand of pasta, but I’m increasingly impressed with how good gluten free pastas are these days. Wow. 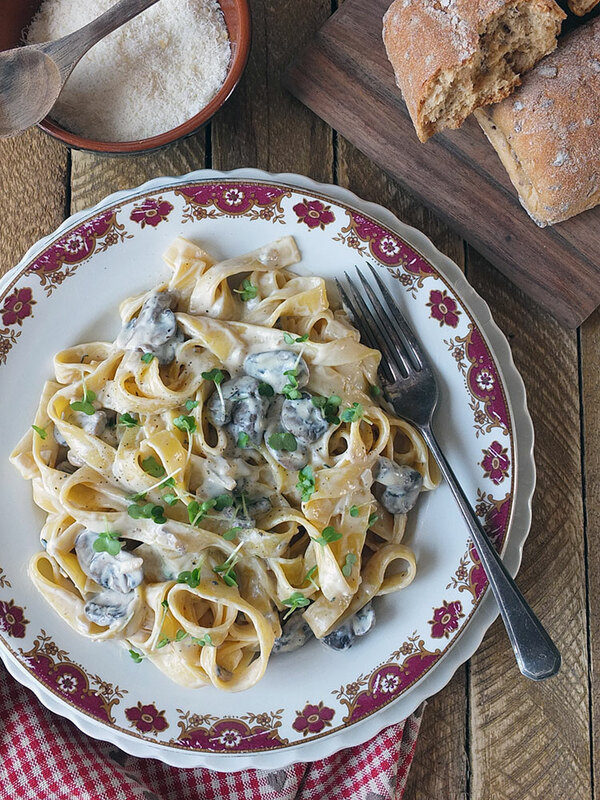 This mushroom tagliatelle really looks delicious. I like mushrooms and pasta, so must try it. Thanks for sharing the recipe. Oh yum, this looks fantastic and love the creamy sauce you made to go with it. oh my goodness this looks absolutely delicious i need to try it!